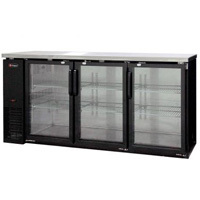 Kegco offers commercial grade back bar refrigerators that are durably built to withstand the rigors of the busiest bar or restaurant. With steel exteriors featuring wear resistant black coating and brushed stainless steel tops, they are built to last. 1/3 hp compressors and foamed in place polyurethane insulation ensure that the contents are kept cold and ready to serve to your thirsty customers!